If there’s one thing the Food Network and Bravo have taught us over the past decade or so: We love watching chefs and cooks put their talents and creativity to the test in competition. The bummer in loving shows like Chopped and Top Chef, though: Unless you’re a celebrity judge, it’s only a feast for the eyes. That might explain why we look forward so much to the Music City Chef Throwdown, held in East Nashville this year on June 14. 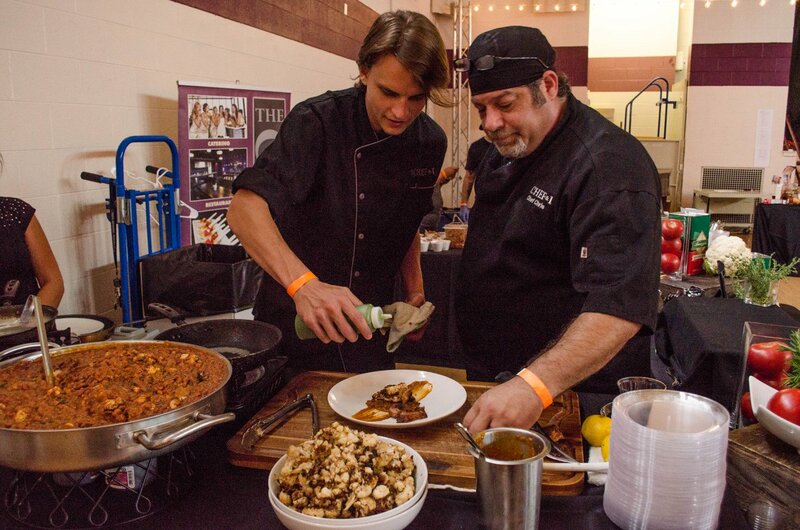 It’s all the competitive excitement with none of the bummer, with chefs and bartenders from some of Nashville’s best restaurants and bars cooking and mixing, then letting us actually try what they create. Added appeal: The event is a benefit for East Nashville’s Martha O’Bryan Center, which works to help Nashvillians in poverty, with employment and education assistance and more. How this annual event unfolds: Participating chefs are asked to create a meal using only simple, approachable ingredients that any of us might have on hand, doing so live, with a time limit. A panel of local experts judges their dishes, and crowns a champion — but it’s not just the judges’ table making decisions at this one. Chef teams also share samples with the crowd, who’ll vote on a People’s Choice Award. With your ticket, you’ll get to sample dishes from every team, and try concoctions from three skilled Nashville mixologists, too. 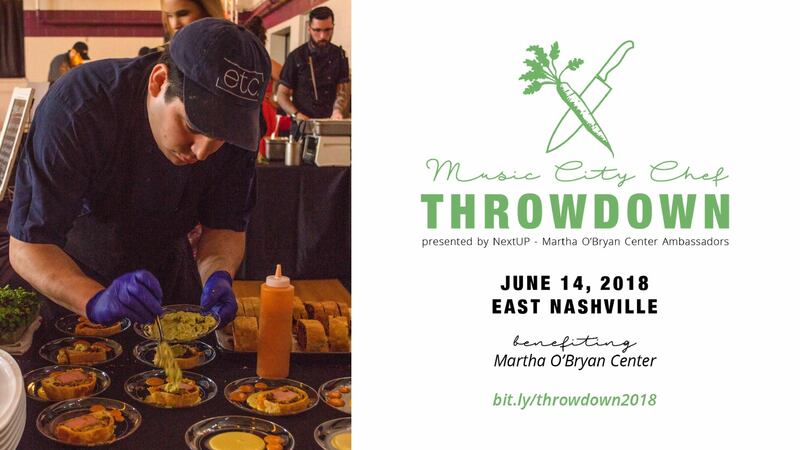 Among the kitchen pros scheduled to battle at the 2018 Music City Chef Throwdown: Kyle Patterson of upscale Melrose restaurant Sinema; Crystal De Luna-Bogan from Hillsboro Village melt shop The Grilled Cheeserie; Duane Loftus from Von Elrod’s Beer Garden & Sausage House in Germantown; chef Matt Bolus from The 404 Kitchen in The Gulch; Bryan Lee Weaver of East Nashville’s Butcher & Bee; and many, many others. On the bar front: Nick Dolan of East Nashville’s The Fox Bar & Cocktail Club and Diane Sweet of neighboring East Side spot Walden will share the spotlight with Jon Howard, head bartender at Midtown restaurant Henley. The judge roundup is fittingly impressive too: Among them, food writer Chris Chamberlain (whose coverage is regularly read in the Nashville Scene), much-admired Nashville chef Deb Paquette of Etch and Etc., and Ashford Hughes, Sr., the city of Nashville’s chief diversity, equity and inclusion officer. 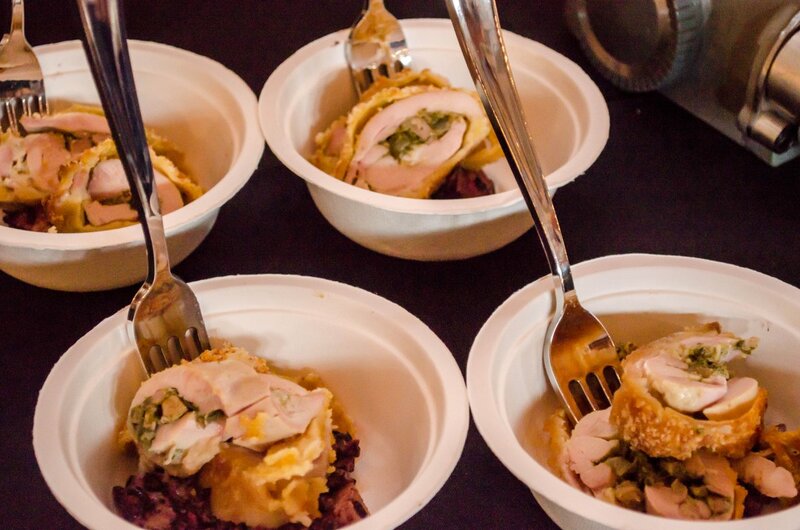 Tickets for the 2018 Music City Chef Throwdown are available now, and they run $69 per person (VIP tickets are available for $100, and a “Host” block good for 10 people runs $1000). And every ticket purchase puts the organizers a step further toward their goal: raising $10,000 for Martha O’Bryan Center. Grab more information, and your tickets, at marthaobryan.org. Beyond, if you’re looking for a new place to make your own culinary creations — i.e. a new Nashville home with a killer kitchen — reach ACRE here. We’d love to help you find your Nashville dream home!